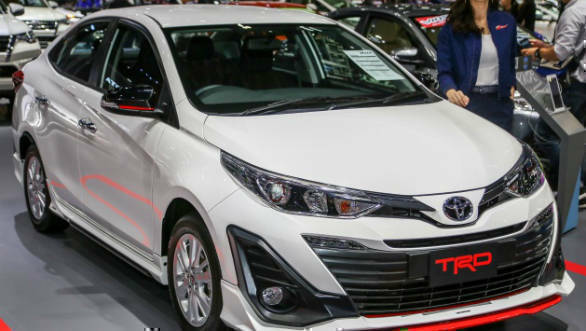 Toyota has shown a sportier TRD (Toyota Racing Development) variant of its upcoming Yaris sedan at the 2018 Bangkok Motor Show. The Thai-spec Yaris Ativ TRD gets cosmetic upgrades over the standard car. These include new, more aggressive front and rear bumpers with black detailing and larger fog lamp housings, body skirts all around with a red front splitter and rear diffuser and ORVMs finished in black with red pinstriping. The engine options are expected to remain unchanged over the standard car. Toyota Racing Development is the performance arm of the Japanese firm and is charged with developing quicker versions of its road-going cars. 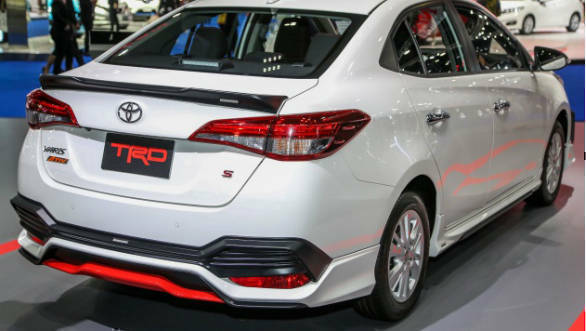 It is still unclear if this variant of the Yaris will be made available in India, but given that the Fortuner SUV, Etios sedan and Etios Liva hatchback have all been sold with TRD Sportivo versions in India earlier, Toyota could bring in a TRD-spec Yaris eventually. To be launched on April 24, the Indian-spec Toyota Yaris is expected to be powered by a 1.5l petrol engine and a 1.4l diesel. The 1.5l is likely to be based on the 2NR-FE motor that powers the Etios sedan, albeit with variable valve timing on the intake and exhaust ports. The engine is expected to produce 107PS and 140Nm of torque. The diesel option will be exclusive to India and will borrow the 1.4l D-4D drivetrain from the Corolla, in a similar 90PS/205Nm state of tune. These will be available with a six-speed manual gearbox and a seven-speed CVT automatic. The Yaris will be positioned as a budget alternative to the likes of the Honda City, Hyundai Verna and Maruti Suzuki Ciaz with prices starting around the Rs 8 lakh mark. The Yaris TRD, if launched in India, could be a viable option for the large number of young buyers who shop for cars in this segment, given that most of the other cars present at this price-point are heavily family-oriented in their positioning.